Washington, April 1965. In a patriotic and brave endeavor, thousands of real Americans have marched across the city to protest against the new policies that the liberals are trying to enforce against us. Their sole aim is to create awareness about the perils that America might endure, if these new bill pass. This is not a joke America. 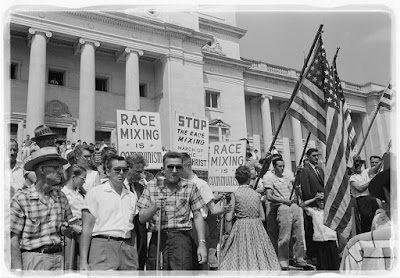 America has never believed in “mixing the races”. These Negros are surely plotting with the commies to destroy the foundation of this society; the family. First, we all know the consequences that a mixed marriage will cause to the children: “There will a problem with both groups accepting a child from such a marriage” and “those children will suffer and we won't help put them through it”. If this bill passes, watch out America because this won’t end here. Then they will be the queers and the commies who will ask for equal rights. Then the family will be about everything but a household in which the father commands and the wife and children obey. Say goodbye to your family, say goodbye to America. A few weeks ago, we did a practical exercise in class which consisted in writing several headlines about each historical period in the USA. I think it was a very useful exercise, for it allows us to have a condensed but practical summary of the all main events that happened in the USA since the beginning of the time. Moreover, I think the use of headlines was a really neat way to bring the subjects. It is through headlines that we usually receive the information in our society in see headline about historical events help us to perceive in a better way the grade of subjectivity that each headline carried. Since this practical exercise, I thought of expanding the headline and write a whole piece of news. News are often used as a political tool (probably the most powerful of all) to spread ideas of a certain political party. Even though this story didn’t exit, it certainly could have been real. First, the picture is not a montage, so something similar of what I have report might have happened. Secondly, I have taken the highlighted sentences from real news about mixed marriage which has happened only a few weeks ago in the XXI century. I thought of making a highly hyperbolic text, which emphasis the spread of lies and misinformation. In this one the author (not me, the fictional journalist who wrote that) stresses a very common policy that has been use in the USA: The spread of fear. The main goal of this headline is to scare the readers and make them believes certain ideas that cannot be proved.